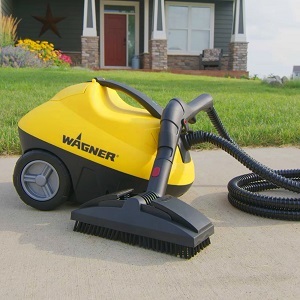 The Wagner 915 On-Demand Power Steamer is a pressurized system that supplies steam at the touch of a button. 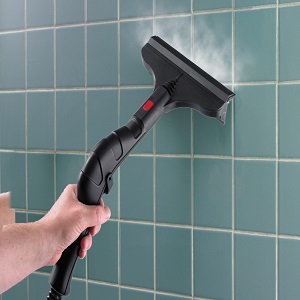 Steam cleans and sanitizes surfaces in one step without chemicals. 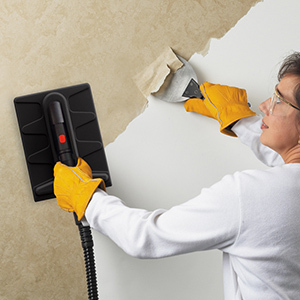 Steam clean kitchen floors, tile in bathrooms and remove wallpaper with 915 compact steamer cleaner. 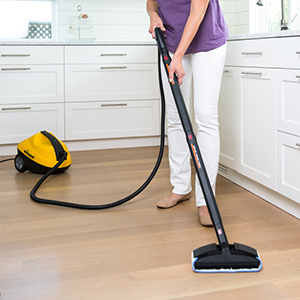 The household steamer can be used to clean barbeque grills, greasy stovetops, bathroom fixtures and floors. The steamer includes a wallpaper steam plate, window/tile squeegee, floor cleaning head and pad, two extension tubes, measuring cup, filling funnel and assorted utility brushes. 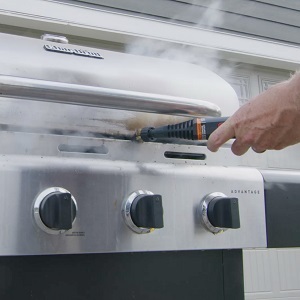 On-Demand 915 Steamer is rated 3.9 out of 5 by 40. 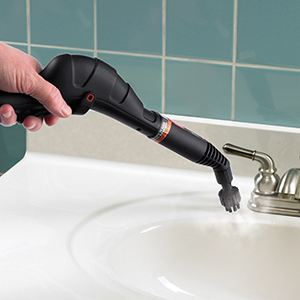 Rated 1 out of 5 by RobertB from Sub Par My 915 only produces 10 -15 seconds of steam before it cools off. 5 year old Shark ran longer than that. Very disappointing considering the money spent. Owners manual also short on info such as various uses and directions, no troubleshooting info. Rated 4 out of 5 by Doody from Not bad Good machine. I’ve had a few, this. Is the best. It has a strong output of steam, there’s no pause to build pressure back up it just keeps going long and steady. I think it needs a better pad that covers the entire floor attachment. Lots of steam escapes. If it had a pad that fits over the floor piece that had elastic to hold it on that would be excellent. If not elastic then a draw string? Something. then it would rate 5 stars instead of four. Rated 5 out of 5 by Elle from Love it! I’ve had it for 4 years and it still does a great job. Rated 4 out of 5 by MarkC from Heavy Duty Unit I recieved this unit about a month ago and have just had the opportunity to use it. The device was packaged well and came with easy instructions. After filling the unit and waiting for it to heat up, about 20 minutes, I used it to clean some tile and grout in my sunroom where cats had made a mess. It thoroughly cleaned both easily. I will use this frequently on hard to clean floors and appliances and expect continued success. Rated 5 out of 5 by Rguadarr49 from Powerful and Light Weight I got this about three months ago. I have used it on my bath tub and shower, also on my pickup truck. I found that the Wagner Steamer was easy to use attachments were great for what I was using it for. On the shower and tub, the steamer removed the soap scum from the tile and glass shower door, it did take a while to finish both shower and tub put I didn't have to scrub. 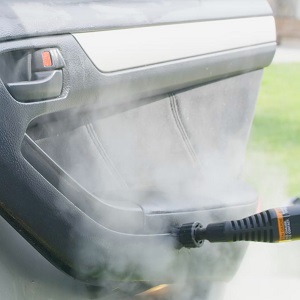 As for my pickup truck, well it was egged while I was out of town, with over 90 degree weather and the egged on my truck for over a week I try everything, then I remember the steamer, so I try it and it removed the egg from my truck Thank you Wagner for a fine product. Rated 4 out of 5 by Grandpa from Nice, powerful machine for size Bought nearly 2 months ago, used for second time today. Cleans great. Will be trying it on wallpaper in months to come. This replaced our rather old other Brand machine that would not put out much steam even after some vinegar treatments. ( Time for new) 2 dissapointments are the cord lenght, VERY short, TOO short and only comes with one cleaning pad. Even 2 more feet of cord would be nicer. Before buying extra pads we tried the old ones from other machine, not a fit, but they do work,, we have several of those to keep using. overall so far like it a lot. Rated 5 out of 5 by Floridian from WOW!!! The only negative thing to say is that the power cord is too short! From the box to the kitchen floor. Went right work on the grout. Fast, Efficient and so easy to use!! Grout has never looked better! Went from Kitchen to both bathrooms, grout, tile, trim, shower, tub. Having so much fun I went out and did the grill. Great job! Highly recommend this product to anyone looking for a steamer. How many BARs it has? If you mean pressure, we don't rate our steamers by pressure output. Call technical support to help us understand your question. 1-800-328-8251. Can you use this machine to steam drapes? This steamer has many uses including drapes. Just be careful of course. Especially with very thin material. Give us a call for further help at 800-328-8251. Thanks for your inquiry! Need to buy a replacement hose bc my dog thought it needed to be destroyed.. Unfortunately the hose is not a replaceable part. Give us a call at technical support to discuss a solution at 800-328-8251. How much water does It hold at a time? The 915 steamer can hold up to 48 ounces of water at a time. For further help give us a call at 800-328-8251 or go to www.wagnerspraytech.com Thanks for your inquiry, have a great day! Is there a satisfaction guarantee or warranty for this product? The 915 steamer is designed for home use, not commercial, and has a one year warranty against defects when used for that purpose. For further help give us a call at 800-328-8251, thanks for your inquiry! Where can I order the floor cleaning head pad? It did not come with my steamer. 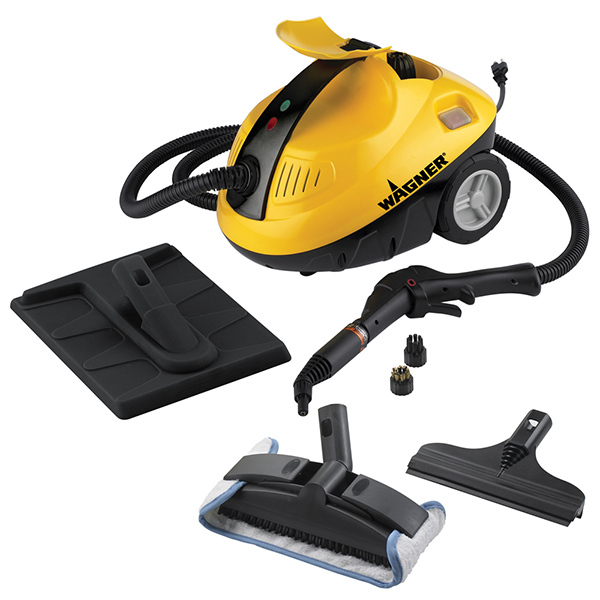 The floor cleaning heat pad can be purchase directly through Wagner. Please give us a call at 1-800-328-8251 Monday-Friday 8:00am-4:30pm Central Time, we will assist you with the order. How hot is the steam when it comes out of the tip. At sea level water boils and produces steam at 212 F. The steam will be slightly hotter than that by a few degrees as it exits the nozzle. Technical support is available at 800-328-8251. I bought a Spraytech 915 from e-bay. Its for 110 Volts. We have 220-230 Volts. Its also wrong plug. Is there a converter so I can use it in Sweden? To expensive to return it to uSA. You can try using a converter that you purchase locally. We do not offer them and only recommend using the correct voltage. You should be able to find something at a local hardware or home improvement store that will work adequately. We do not have any specific brands or recommendation though.